Vitamin-R is a collection of tools and techniques designed to overcome the biggest productivity challenges facing today's new caste of creative professionals: managing attention and maintaining motivation. It complements the task capturing and organizing features of modern to-do list managers, by forcing you to concentrate fully on one task a time and keeping distractions at bay. Vitamin-R smooths the creative process by rejecting the dusty business book notion of self discipline and fully embracing the way our brains are truly wired. 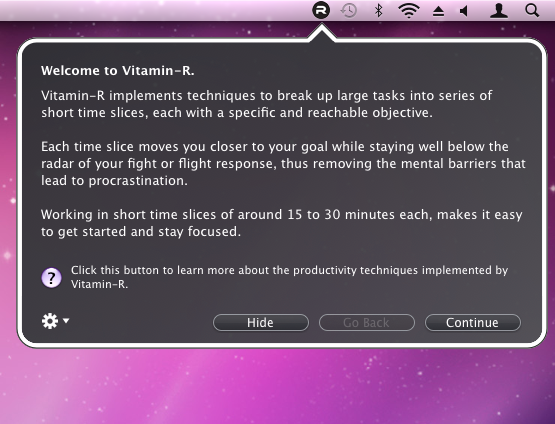 Vitamin-R breaks down large, vaguely defined tasks into a series of short "time slices" of between 10 and 30 minutes, each with specific, easily reachable and actionable objectives. During these time slices it keeps you focused on accomplishing only this one objective and provides you with mechanisms for dealing with interruptions, poor concentration, etc. Vitamin-R concentrates on getting started which allows you to break through the resistance of procrastination and creates a positive feedback loop of small achievements that get you closer to your ultimate aims. This greatly reduces the stress caused by looming deadlines and a lack of a clear direction, thus enabling you to enjoy guilt-free breaks in which you can pursue other interests. Vitamin-R provides you with the "Now & Later Board", complete with FastType magic, to give you a place to quickly dump all those things that go through your head and allows to get back to the task at hand. While Vitamin-R assists you in getting on with your work, it also keeps a customizable record of your progress that can help you detect positive, os well as negative work patterns thus allowing you find the way that suits you best.